The mattresses series V.I.P. collection combines pleasure and luxury. It consists of the world’s leading independent pocket nested springs. Name asc. Price asc. Price desc. New desc. Best Sellers desc. Most Viewed desc. The quality of a Silver Plus Coco is perceived from the first time you lie down on it. Not unjustly, since the well-built Mini Bonnell springs with a metal frame are harmoniously matched with coconut-like content, offering a balanced surface to rest your body with adequate perimeter support. Exterior reinforcement with Board protection technology helps keep the mattress form while the combination of woolen and cotton wadding adds even more natural and friendly skin care. With an afrolatex and coconut content, the Silver Afrolatex Coco anatomic mattress is an excellent choice for those who want to give their body a gentle and particularly cool surface during sleep. In this also helps the combination of wool and cotton wadding that enhances the mattress's ability to maintain the right temperature. It consists of Mini Bonnell springs with a metal frame that ensure a high level of weight and excellent perimeter support. Soft anatomic mattress that has its own unique way to give moments of relaxation. Silver Extra Latex Coco is combining coconut with latex in its content to offer an extra soft surface with elasticity and the ability to keep its coolness. It consists of Mini Bonnell springs with a metal frame for greater resistance to increased weight and ideal body support around the perimeter. It has wool wadding and cotton wadding that contribute to the right "breathing" and gentle sensation it offers. Not only you can get the cool feeling you need from your mattress, but also treat sweating well thanks to the addition of Memory Gel, the Gold Memory Gel Polo Coco anatomical mattress protects from anything that tries to interrupt your pleasant sleep. Featuring coconut and horsehair felt in its content, it behaves extremely good against wetness also offering hypoallergenic properties. Its soft surface is supported by Mini Bonnell springs with a metal frame for greater resistance to more weight and at the same time, ideal edge support. The Gold Latex Polo Coco is a case where its particularly soft surface is ideally suited to extraordinary temperature levels to make your sleep look like a comfortable dreamy trip. The combination of coconut-horsehair-latex content synthesizes a soft and elastic content that knows to "breathe" properly, preventing wetness and other harmful elements of the atmosphere from disfavoring your body. At the same time, the construction of Mini Bonnell springs with a metal frame adds more durability to increased weight and robust perimeter support. Construction with emphasis on natural materials allows you to enjoy unique moments of cool and soft relaxation. The anatomical mattress of Platinum Memory Gel Polo Coco often overwhelms perspiration problems for a body with the help of Memory Gel technology that shields the mattress against elevated temperatures. At the same time, the combination of horsehair felt and coconut inside offers elasticity and ideal behavior for the body. The Mini Bonnell springs with metal frame provide durability and enhanced perimeter support. Being an ideal choice for those who want a very soft but cool mattress for their sleep, the Platinum Extra Latex Polo Coco comes to offer the perfect solution. Combination of latex with coconut and horsehair felt inside gives you a particularly soft surface for your body with friendly behavior for your skin. Mini Bonnell springs with a metal frame provide the durability you need throughout the length and width of the mattress. Extremely soft and anatomic mattress that offers an ideal feeling of coolness in your body. Handmade construction customized with handmade bindings, giving mattress resistance, better ventilation and skin-friendly feel. Memory Gel technology can regulate the temperature of the mattress by fighting sweating. This also contributes to the content of horsehair felt and coconut that complete an overall quality selection of soft mattress with excellent atmosphere-friendly attitude. Enhanced strength in increased weight, including Mini Bonnell springs with metal frame. What happens when you lie on a Diamond Royal Latex Polo Coco Kapitone? Your body has the opportunity to "sink" into a super soft, cool and skin-friendly surface. The impeccable quality of this anatomic mattress begins with its handmade construction with handmade bindings in Kapitone design that greatly enhances the ventilation of the mattress and its adjustment to cool temperatures. Coconut, horsehair felt and royal latex offer the ideal content of high quality materials for elasticity and proper "breathing". The support on Mini Bonnell springs with a metal frame signifies strong strength across its entire surface. If for you the case of sleep and luxury are synonymous words, then the Silver Plus Orion Pocket Kapitone anatomic mattress will become your favorite… friend! Equipped with top-of-the-world Pocket nested springs, it provides expert support throughout your body. Thanks to the advanced multi-zone technology activates all the necessary parts of the mattress for optimal body alignment and a pleasant sleep. It features HR Foam and Board Protection Technology for better perimetric support and maintenance of its shape for years of daily use. His handmade knitted fabrics combine elegance, durability and proper ventilation of the mattress. Containing even more enhanced foamy materials, Silver Afrolatex Orion Pocket Kapitone promises you a soft and comfortable environment for... countless dives in your dream world! It is equipped with higher quality pocket springs combined with superior multi-zone technology to activate all the necessary areas of the mattress to provide the best musculoskeletal support and rest for your body. Its internal reinforcement with foam and HR Foam offers a gently smooth feel while making the mattress very durable. It is covered externally with handmade bindings in Kapitone design that contribute against sweating. Another extraordinary Silver option for comfort and luxury sleep is the Silver Extra Latex Orion Pocket Kapitone anatomic mattress. Combining Latex with HR Foam inside offers a fluffy surface with friendly behavior to your body, elasticity and endurance over time. But the ultimate advantage is the absolute relaxing feeling you will experience thanks to the higher quality multi-zone technology that provides specialized support to all the sensitive parts of your body. Supported by top-of-the-kind Pocket nested springs that gently embrace the body while its outer casing has handmade bands in Kapitone design for optimal temperature adjustment. For those who want to experience a pure... aristocratic sense during their relaxation time then the Gold Memory Gel Polo Orion Pocket Kapitone is an ideal mattress! The combination of a natural material, such as horsehair felt, according with memory gel, positively affects the balanced adjustment of temperature and humidity, also ensuring high durability. Featuring independent Pocket nested springs as well as unique multi-zone technology, it gives you the ultimate sense of relaxation in all parts of your body, serving each different need. The handmade Kapitone design on its surface combines elegance, strength and excellent "breathing" of the mattress. If you prefer a very soft and luxurious mattress, you can just try the Gold Latex Polo Orion Pocket Kapitone. 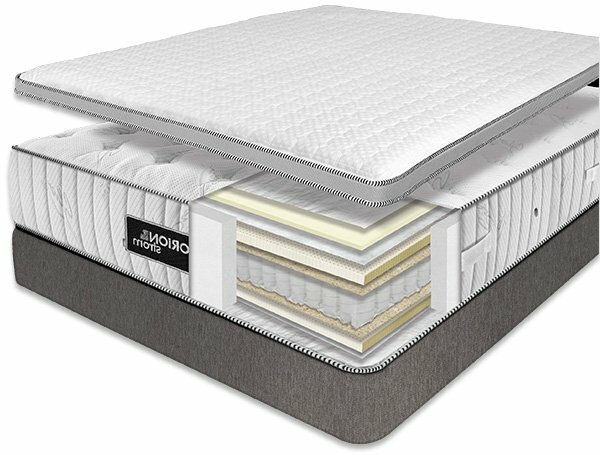 The combination of top Pocket nested springs with multi-zone technology provides you with a unique quality of sleep by activating all the necessary levels to relax every part of the body according to your needs. Inside it features natural horsehair felt and advanced materials such as latex and HR Foam technology for greater flexibility, durability and better temperature control. All this is reinforced by the handmade Kapitone design on the outside that contributes against body sweating. Sleep has never been such beneficial experience as with the Platinum Memory Gel Polo Orion Pocket Kapitone anatomical mattress. Coming from a superior class, he knows to take care of your body in every detail. Multi-zone construction that provides ideal support for all sensitive parts of the body, ensuring uniform weight distribution. It also has Memory Gel technology to respond extremely effectively in cases of high temperature or perspiration, staying constantly friendly-feeling level. It includes lining with handmade bindings in Kapitone design, increasing its durability during daily use and giving even better levels of ventilation. Inside, it includes horsehair felt that strengthen the defense against wetness and help maintain the naturalness of the mattress. Supported by top independent Pocket nested springs. Extremely soft and particularly comfortable anatomic mattress, designed to make your sleep an exciting experience! Its construction puts a lot of emphasis on your body's needs, so it's a multi-layered mattress that offers perfect support to your entire spine and sensitive body parts exposed to painful movements throughout the day. The combination of latex with horsehair felt inside form a super soft and elastic environment that prepares to gently accommodate your body. Featuring top independent Pocket nested springs, it has been hand-crafted in a Kapitone design that enhances its elegance and durability.